Across industries, service providers of all types—including systems integrators, outsourcers, and in-house IT departments—are today responsible for managing and securing an increasingly large and diverse array of devices, ranging from traditional business desktops, notebooks, and servers to Internet of Things (IoT) systems such as retail point-of-sale terminals, digital signs, vending machines, ...and even ATMs. 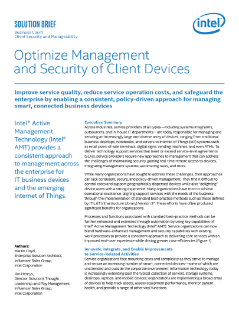 To deliver technology support services that meet or exceed service-level agreements (SLAs), service providers require new approaches to management that can address the challenges of maintaining security, gaining real-time remote access to devices, integrating management systems, automating tasks, and more. While many organizations have sought to address these challenges, their approaches can lack consistent, secure, and policy-driven management. They find it difficult to control costs and support geographically dispersed devices while also “delighting” device users with a strong experience. Many organizations have tried to achieve operational excellence, aligning support services with the needs of the business through the implementation of standard best-practice methods such as those defined by ITIL (IT Infrastructure Library) Version 3*. These eﬀorts have often produced significant benefits for organizations. Bob Rogers shares how companies are using advanced analytics and AI. He describes key imperatives to help achieve success. Cloudera's Steven Totman, Intel's Parviz Peiravi, and SAS's David Wallace discuss how to fight fraud.